FOXBORO, Mass. 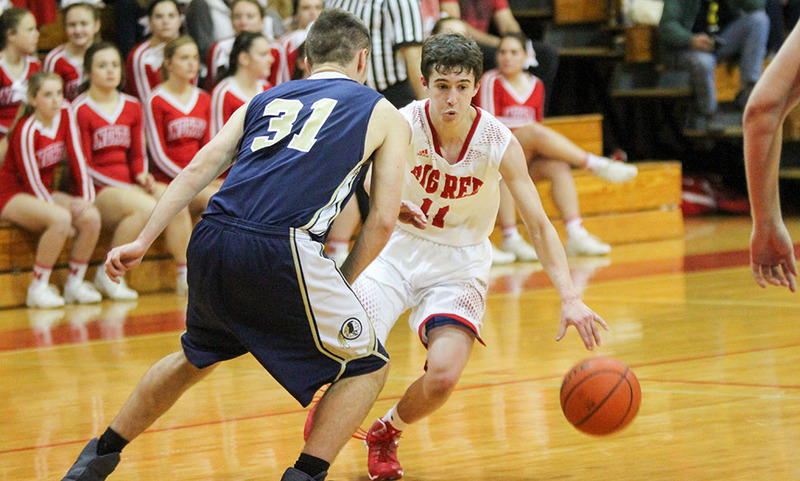 – In a game filled with scoring runs, North Attleboro happened to have the last one, as the Rocketeers outpaced Foxboro 7-2 down the stretch to pull out the Davenport division game 53-47. For North, it all started with Jonny Friberg (17 points, 11 rebounds), who scored 14 of his points in the first quarter alone. The 6-foot-6 center seemed unguardable and led North on a 7-2 run to start the game, only for the Warriors to respond with a 9-2 run of their own. The second quarter was all Foxboro, as seniors Andrew Block (13 points) and Mark Clagg (7 points) led the team on an 18-6 run that ended with the Warriors up 33-27 heading into halftime. The Warriors defense stymied the Rocketeers by swarming Friberg every time he touched the ball and held North to just six points in the quarter. The game’s momentum shift came with 6:14 left in the third quarter as Friberg grabbed an offensive rebound and dunked it with authority, posterizing three Foxboro defenders. This was the highlight in North’s 7-0 run to start the second half, capitalizing on three Foxboro turnovers. After that, the third quarter featured a back-and-forth battle that saw four lead changes, as Foxboro’s Block and Brandon Borde (10 points), matched North’s Tom Reynolds (11 points) and Brent Doherty (9 points), tying the game at 41 heading into the final period. The score remained close all the way until the 4:00 mark in the fourth quarter when Hacmoni Cuevas hit a three that flipped the switch back in North’s favor, starting a 7-2 run down the stretch that handed North the win. The defense was the key for the Rocketeers, who caused 10 turnovers in the second half and allowed just six points in the fourth quarter, helping the team outscore the Warriors 26-14 in the second half. Next up, North Attleboro (7-4) will host rival Attleboro and Foxboro (4-6) will host Taunton on Tuesday. FOXBORO, Mass. – Heading into the final eight minutes of Tuesday’s contest, Foxboro head coach Jon Gibbs knew he had to make a change. Gibbs elected to switch things up and deployed a defense-first lineup. That choice proved to be fruitful as the Warriors limited Canton to just one field goal for over seven minutes and turned a five point deficit into a seven point lead and a 55-51 win over the Bulldogs. Canton’s Devin Foster scored with 6:43 left in the game to put the visitors up 44-39 but that would be the last points the Bulldogs would score until less than a minute remained in the game. In that span, Foxboro rattled off a 12-0 run. Though it didn’t happen quickly, the run was spurned on by lockdown defense. Andrew Block, who made his return to action for the first time since late December, started the run with a jumper and then found Teddy Maher for the tying three pointer with 4:29 to play. Joe Morrison (four points, five rebounds, seven assists) found Jamaine Few (14 points, 11 rebounds) on a bounce pass down low to go ahead by a basket and then Morrison put the Warriors up two possessions with a layup with 2:38 to play. Block (14 points, six rebounds, three assists) then put an exclamation point on the run, taking a pass from freshman Brandon Borde (10 points) and draining a three to go up 51-44 with 1:15 to play. Morrison was the anchor of Foxboro’s defense and was a big piece in the defensive lineup change in the fourth quarter. 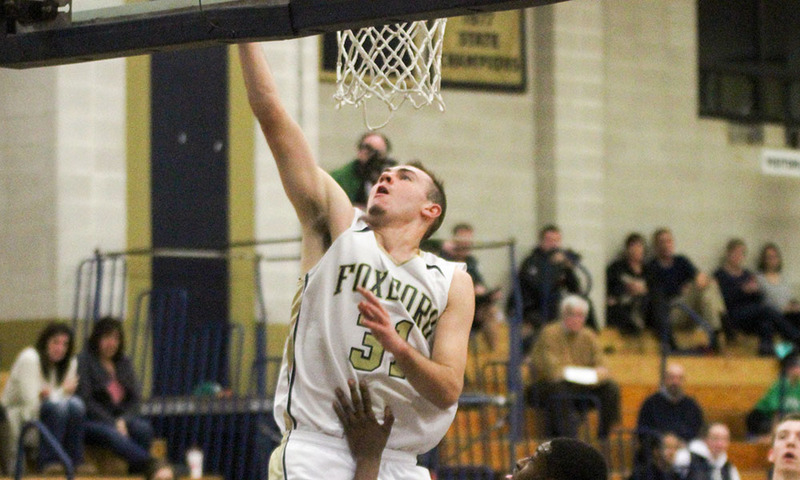 Morrison, along with Maher, Few, Block and Borde, made up Foxboro’s defensive first look in the final frame. For three quarters, Morrison held Canton lead scorer Devin Foster to just four points. For the fourth quarter, Gibbs elected to switch Morrison onto Canton’s Tony Harris, who had scored 20 points through three quarters. Morrison kept Harris scoreless in the final quarter while Maher took on the role of guarding Foster and kept him to just seven points in the final eight minutes. “It was a funny game because early on I thought both teams were scoring pretty well,” Gibbs said. “Then all of a sudden the game hit a point where we we got some stops but then we couldn’t score so it was a little frustrating. But in the end we dug down deep and got some stops when we needed to and found a lineup that worked well together and we kind of rolled with the hot lineup. Block scored nine of his 14 points in the final quarter. “I don’t know how he’s doing it. He came back to practice over the weekend and he looked totally like himself, I was really surprised. He had two great practices and tonight he did the same thing, he played really well. He stepped up, just like seniors do, and made big shots and made big plays for us down the stretch. Both Canton and Foxboro had little trouble scoring in the opening quarter. The Bulldogs put up 19 points on 67% shooting while Foxboro dropped 17 points on 80% scoring. The offenses slowed a little in the second quarter with the Warriors taking a 31-30 edge into halftime. The Bulldogs outscored Foxboro 12-8 in third quarter behind strong play from senior center Brian Albert. Albert scored all six of his points in the frame, including a midrange jumper from the corner that beat the shot clock, and hauled in four of his six rebounds in the quarter. Foxboro outscored Canton 16-9 in the deciding fourth quarter. Foxboro (4-5 overall, 3-4 Hockomock) hosts North Attleboro in a key division game on Friday at 6:30 while Canton (4-5, 2-5) tries to bounce back the same day at home against Stoughton.